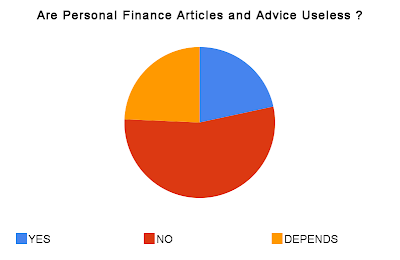 Are Personal Finance Articles and Advice Useless? - Why do you think so? Some times back I gave my Interview to Ranjan Varma, where I discussed My views on Financial Planning. I also read his views on Why Personal Finance Articles and Advice is Useless? Personal finance web has increased to a big size in last some years and most of them give useless information. I decided to Find out what do Readers think about this themselves and here are the results. This is the result of the Poll I conducted some time back at this blog with question “Are Personal Finance Articles and Advice Useless”? The results are based on just 74 votes but its quite an ok sample and the results suggest that only 21% people thinks that its of no use but majority (54%) thinks that’s its useful and rest of all thinks that it depends on the person. I agree with Ranjan Varma on the fact that Personal Finance articles can give you sense of Direction, but its you who have to take Action at the end. This is totally true. Here at Jagoinvestor that’s the reason why I talk on two things HOW and WHY? How to calculate your insurance Requirement ? How to Findout If a product suits you ? How to Choose Good Mutual Funds ? There are other Categories of articles which are Psychology oriented articles which make you think which actually answer your question of Why Financial Planning is important . These are thought provoking articles which will open your mind and make you feel what you are missing from so many years… I hope I am doing it successfully on this blog. These are the type of articles which you can use to do your Free Financial planning but remember that it needs a lot of efforts and time. People who do not understand much of these or Are not interested should see a Personal Financial Planner (Certified Financial planner). Check out RupeeManager, A personal Finance Software which Ranjan is building. What is Goal of Financial Planning ? Can you live with 90% of your Salary ? My take on the subject is that Personal Finance articles will be useful to someone only when he thinks about his Finance with a Responsible Attitude. You need to ask lots of “Why” questions, you need to know a few “How’s” and a fraction of “Interest” to take care of your Financial Planning. Lots of Readers have mailed me and told me how they are changing there views about Financial Planning by reading this blog and how there Finances have taken a better shape now… I feel good hearing this. I think you should take the poll again and I bet there would be a different pie chart this time :-). ultimately what you do on ground is what matters. You're doing a great job with your articles. I have a problem with articles which has been written by people who do not research it properly. And then it's the action taken on those articles that is important.